If you are responsible for administering the IT infrastructure at a small-to-medium size business (SMB), using network monitoring, mapping and alerting software can help you do your job better by maximizing network uptime and efficiency. These tools are generally powerful, easy to use and affordable. After you enter the most important pieces of equipment to monitor, they just run in the background - only alerting you to active or impending issues related to hardware, software or bandwidth utilization. 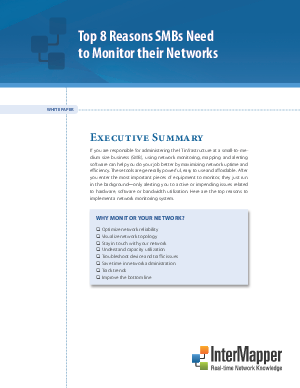 Here are the top reasons to implement a network monitoring system.